A key feature of burglaries is that people typically try to remove items from a home, rather than move them in. This basic fact seemed to elude Tonganoxie Police, who handcuffed a 61-year-old black man on the front steps of his new home as he wrapped up an arduous day of moving in. According to the Kansas City Star, the incident happened back in August, though Karle Robinson only recently opened up about the experience. After a long, 12-hour day of moving in, Robinson, a military veteran, was moving in his final piece of furniture, a large-screen television, when police pulled into his driveway. It was late—around 2:30 am on a Sunday—so Robinson was aware that it might appear dubious. The police officer’s voice came through on the body camera as Robinson watched. He watched himself wearily complying with the white police officer’s commands, submitting to handcuffs in front of the new home—his first as a homeowner—a city guy finally living out in the country as he’d dreamed of for so long. As the passage suggests, Robinson watched the video alongside a Star reporter. Captured on camera is eight minutes of Robinson sitting on the front steps of his new home, his hands cuffed behind his back, as an officer questioned him and waited for backup. 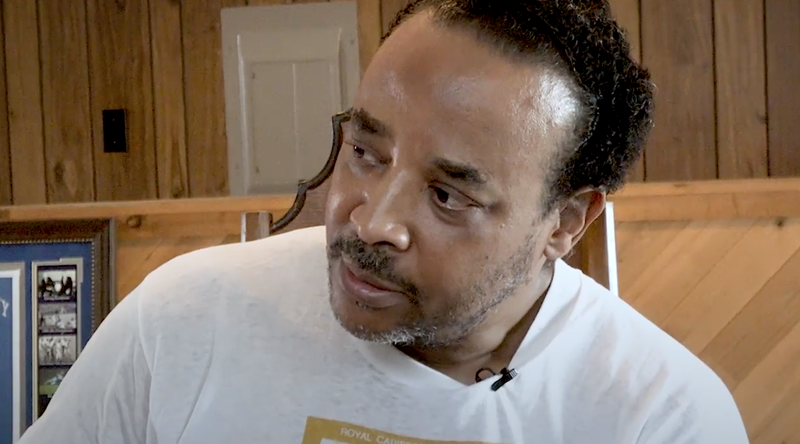 Officers responding to the call eventually found Robinson’s story checked out: seeing evidence of items recently moved into the house and paperwork corroborating Robinson’s story. Uncuffing Robinson, they apologized and, upon Robinson’s request, helped him move in the TV. But for obvious reasons, the entire experience is still unsettling to Robinson, who went to Tonganoxie Police Chief Greg Lawson to file a complaint about the interaction. He told the paper that had he been white, he would have been allowed to show his identification and retrieve his paperwork—the entire incident would be cleared up in a matter of minutes, without handcuffs. During the interaction, the officer who first arrived on the scene explained that there had been a lot of break-ins in the neighborhood recently. “Out here?” Robinson asks, incredulously. But after following up with his neighbors, Robinson told the paper last week that was a lie. No one he spoke to was aware of any break-ins, he said. Chief Lawson maintains that race didn’t play a factor in how Robinson was treated, claiming that because the officer was alone, handcuffs were necessary. “If I were on that call, by myself, no matter the race of the person, they would have been handcuffed,” Lawson told the paper. A follow-up article from the Kansas City Star’s editorial board sided with Robinson, and demands a public apology from the Tonganoxie police for the humiliating incident.